Waste Hauling in Charlestown Township is handled by private contract. If you live in a larger community that has a Homeowners’ Association, in some cases your HOA secures the contract for waste hauling & recycling services for your entire development. In Charlestown Township, trash, recycling and yard waste pick-up is provided by the registered private haulers listed below. For more information, contact the haulers directly. Haulers in Charlestown are required to recycle in accordance with Ordinance #153-2009. Charlestown Township is an active Participant in the Regional Southeastern Pennsylvania Hazardous Household Waste Program. Bring unwanted hazardous household automotive products, home maintenance, lawn and pest control products to the next Collection event. There are six events as listed below. A poster is available of the above events provided by the Chester County Solid Waste Authority (www.chestercountyswa.org). This is an event for residents only: businesses will be turned away. Do not mix Materials. Bring all substances in original containers with labels. Items must be identifiable. Tighten lids on all containers. If containers are leaking, pack in larger container with newspaper to soak up leaks. Electronics, Latex (Water Based) Paint, Used Motor Oil, Explosives & Ammunition, Asbestos, appliances, Infectious or Medical Waste, Radioactive Waste, PCBs, Unidentified Waste, Pressurized CFC’s & HCFS’s, Tires, gas cylinders, alkaline batteries, white goods, Freon appliances, 50-gallon drums. Latex Paint is NOT Toxic. To dispose of Latex Paint, air dry or absorb latex paint with kitty litter or other absorbent, then dispose of in your regular trash. Newspaper – including inserts, may be placed in a paper grocery bag, rigid container, or bundle with string into a stack. Residential Mixed Paper – place this material in a paper grocery bag, including: junk mail, magazines, envelopes, catalogues, phone books, cereal boxes, notepaper, etc. It is OKAY to mix with newspaper. Corrugated Cardboard – flatten and separate from other paper materials. Cardboard may be bundled with string. Glass–all colors. Rinse, remove lids and rings. Labels are OK.
Plastics - #1 through #7. This number is found in a triangle on the bottom of the container. Call your private hauler for additional information on how to prepare your recyclables for curbside pick up. Taken from PAPER OR PLASTIC, THOSE PESKY PLASTIC BAGS by Nancy Fromnick, Chester County Recycling Coordinator. What is the better choice a paper or plastic bag? A reusable bag of course is the best choice. However, other bags also have their place. A few years ago, a couple of communities in California banned plastic shopping bags only to find out that the sale of plastic garbage bags and wastebaskets liners went up. They discovered that many people use the free plastic bags they get at the store for kitchen and bathroom trash collection as well as diaper and pet waste cleanup. The free bags were replaced with bought bags. Those bans were lifted at the time. Chester County grocery stores have collection containers at their entrances to collect and recycle plastic bags. Some bags might rip or have a hole in the bottom, making them unusable for home trash collection. Back to the grocery store entrance container is the place for them. But there are many other items to recycle in those containers you might not be aware of. You can also put in plastic newspaper sleeves, dry cleaning bags, bread bags, product wrap (used on paper towels, diapers, bathroom tissue, water bottles), food storage bags, produce bags, bubble wrap, LDPE/HDPE films and any film packaging or bag that has the How2Recycle Label shown. Please recycle only CLEAN and DRY bags and film and remove receipts or any other items. Never put plastic bags in your curbside recycling bin. A plastic bag at a recycling facility can jam expensive sorting equipment. Clean plastic bags mixed with sawdust will become plastic lumber – a deck, a dock, a fence, bench or even an attractive outdoor recycling container. Our neighbors at the Borough of Phoenixville have graciously extended access to their yard waste drop off site to Charlestown residents. For a fee of $5.00 per car or $10.00 per truck, Charlestown residents may drop off yard waste including the following: brush, flower and flower cuttings, garden trimmings, grass clippings, houseplants, leaves, pruning, shrubbery, tree trimmings, tree twigs and branches, weeds, untreated wood chips and yard debris. They accept trees up to 24” in caliper. In addition to the drop-off service, Phoenixville Borough offers yard waste compost, leaf compost and hard wood mulch to participants for a small purchase price. Charlestown Township is greatly appreciative of this service, and we hope our residents will find it useful. There is an attendant on duty who is responsible for directing the unloading of materials and the activity of those visiting the site. All persons entering the facility agree that the attendant may ask to see their driver’s license and may take a picture of the vehicle and its registration plate. All persons must sign the visitors’ log. This service is offered to residents only and is not for commercial enterprises. The fee for Charlestown residents is $5.00 per car and $10.00 per truck. Only permitted items can be deposited on site. Deposit of other items is prohibited. These materials include dirt, stone, tree stumps, concrete, plywood, blacktop, construction material, treated or painted wood, recycling materials, food waste, pet waste, and hazardous waste. Leaves and other yard waste may be either loose or in biodegradable paper bags. They cannot be in plastic bags. Leaves can be loose in a vehicle as long as the vehicle is tarped. Removal of material other than that provided for your use is prohibited. The attendant on duty has the right to reject any or all material brought to the site. Failure to follow their directives is prohibited. 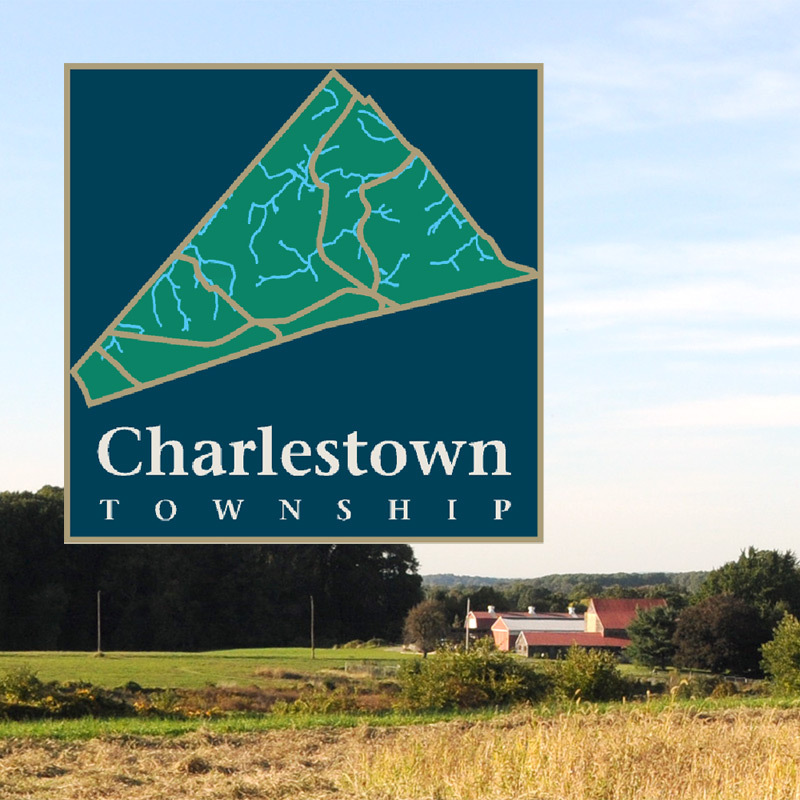 Charlestown Township is mandated by Pennsylvania Act 101 to recycle. Commercial and Institutional establishments in Charlestown must separate and store the following materials for recycling collection. Leaves and yard waste should be used in a compost pile. An option for those who cannot compost: Your registered waste hauler is required to offer leaf and yard waste pick up a minimum of twice a year in the Spring and Fall.